Greenwood Community Church in Denver. A private burial ceremony will take place Friday, Oct. 6. In lieu of flowers, the family would appreciate contributions to Western Illinois University, c/o WIU Foundation, Sherman Hall 303, 1 University Circle, Macomb, IL 61455-1390. A full obituary, and guestbook, can be found at http://tinyurl.com/yb493gdn. MACOMB, IL -- Western Illinois University Alumnus Robert "Red" Miller, 89, one of the coaches who led the Western Illinois University Football Leathernecks to the 1959 undefeated season and to the Illinois Intercollegiate Athletic Conference (IIAC) championship, and former coach of the NFL Denver Broncos, passed away today (Sept. 27) in Denver. Services are pending. 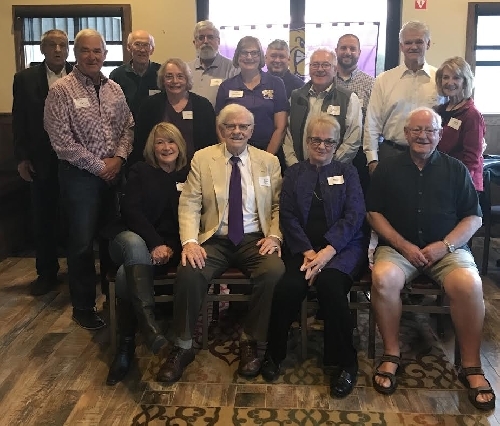 Miller, who received his bachelor's degree in 1950 and his master's in education in 1955, was was an all-state player for Macomb High School and a Leathernecks Football standout. He was named MVP in 1947, 1948 and 1949, when he was the Leathernecks team captain. After his graduation from Western, Miller coached at high schools in Astoria and Canton, and at Carthage College. He joined the Leathernecks as an assistant coach in 1958 under Coach Lou Saban. Miller also coached the WIU swim team from 1957-1960. Coach Saban then tagged Miller and WIU Assistant Coach Joe Collier to join him in the NFL. Miller went on to coach 24 years in the NFL, including first serving as the offensive coach under Saban for the Patriots in 1960. He also was an assistant with Buffalo (1962), Denver (1963-65), St. Louis (1966-70), Baltimore (1971-72) and New England (1973-76) before rejoining the Broncos as head coach in January 1977. One year later, he led the Broncos to their first Super Bowl. "I still vividly remember playing basketball against Denver University in Denver shortly after Broncos lost the Super Bowl in 1978," said Brad Bainter, vice president for advancement and public services and former Leathernecks Basketball player. "Red walked into the gym and it was like time stood still for a bit and there wasn't a basketball game going on because of the ovation for Coach Miller. "Red would have turned 90 on Oct. 31, and he still attended WIU alumni events in Denver and was still in demand for media interviews. We could always count on Coach for leading everyone in the room in his rousing version of the WIU Fight Song," Bainter added. "Red was a true Macomb and WIU legend, and he will be greatly missed." The Broncos reached the playoffs the first three seasons of Miller's tenure as head coach. Denver went 8-8 in his fourth season in 1980, and after the team was sold, Miller went on to coach the Denver Gold of the United States Football League. After his football tenure, Miller worked in the brokerage business in Denver. He will become the 32nd member of the Broncos' Ring of Fame when he is inducted Nov. 19 when his former team hosts the Cincinnati Bengals at Broncos stadium. The ceremony coincides with the 40-year anniversary of the Miller's Broncos' 1977 team that finished 12-2 and beat the Pittsburgh Steelers and Oakland Raiders in the playoffs to win the AFC title and play in the team's first Super Bowl. Miller was inducted into the Western Illinois Athletics Hall of Fame in 1974. He also has received the Alumni Achievement Award (1973) and the Distinguished Alumni Award (1974). "Western Illinois Athletics is saddened to hear of the passing of Leatherneck great, Red Miller. As a member of our inaugural Hall of Fame class in 1974, Red left an indelible mark during his time in Macomb, and proudly represented the Leathernecks at the highest levels of professional football," said Director of WIU Athletics Matt Tanney. "We extend our sympathies to Nan and the entire Miller family." Miller is survived by wife, Nan; one son, Steve and stepson, Jeff. He is preceded in death by his daughter Lana.